USB Multimedia Keyboard - Custom Sensors, Inc. 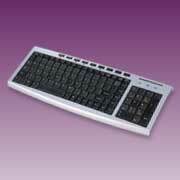 The Model USBK02 USB Multimedia Keyboard. The device is powered through a standard USB port. The True-Touch USB multimedia keyboard. The keyboard comes with multimedia hot keys and 10,000,000 key stroke life cycle. The unit can be used on PCs running Windows 95, 98, ME, XP and 2000.